At the outset, the acquisition and merger of Sunrise Bhd into UEM Land Holdings Bhd early last year looked like a simple, straight forward corporate exercise that went without a hitch. But behind the scene, many man hours have been expended to ensure a smooth integration and transition for the 1,000-strong staff in the enlarged property group. UEM Land Holdings Bhd managing director and chief executive officer Datuk Wan Abdullah Wan Ibrahim concedes that the integration and transition phase is not without its challenges and there are a range of issues that needed to be looked into. “When the acquisition of Sunrise was completed, we did not want to rush into things because both companies have got good offerings and their own unique selling propositions. “The old UEM' is principally a township developer and a government-linked company, while Sunrise, led by Datuk Tong Kooi Ong, is a well known brand for its luxurious condominiums and high-rise integrated projects. “We got to know each other's DNA before proceeding to address the various issues ranging from human resource matters to alignment of systems and procedures,” he relates to StarBizWeek. With each side having about 500 staff, the enlarged UEM Land saw its staff number doubled to 1000. The realignment and consolidation of its human resources involve the redeployment of staff, job scope and responsibilities, and a uniform reimbursement and reward system, among other things. A new organisation structure emerged with the right candidates brought in to head the various departments, Wan Abdullah says. He adds that the redeployment of staff in the two companies has resulted in better synergy and operational efficiency. 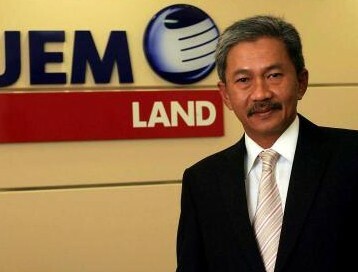 A good example is the redesignation of Sunrise chief operating officer (COO) Lum Tuck Ming as the group COO of UEM Land. With Lum on board as the UEM Land group COO, Wan Abdullah says it has freed up his time from having to handle the daily routine operational and project matters, to focus mainly on more important strategic decisions for the medium to long term growth of the company. With regard to staff remuneration, he explains that Sunrise adopts the seven good years scheme where staff will be rewarded based on their performance over a seven-year period, while UEM Land uses the short-term and long-term reward system. “We opted to retire the Sunrise scheme and paid off the staff, and replaced it with a new remuneration scheme that covers terms of employment, salary structure, and other benefits. The new scheme will be presented to the board for its approval later this month,” Wan Abdullah notes. The system and work procedures also have been streamlined and unified to ensure uniformity. Wan Abdullah says UEM Land is still undergoing a major shift in its work culture with the adoption of the Sunrise matrix system that requires staff to be seconded to projects from the start to their completion. Previously, UEM Land employs the central support department system. “This major shift in our work culture will no doubt result in higher accountability and responsibility among our staff,” Wan Abdullah says. There are also many synergistic benefits that can be tapped and one of the more obvious will be the enhanced skills and branding advantage that Sunrise brings with it. With 35 years of involvement in high-rise developments and its success in building up Mont'Kiara into a renowned luxurious residential address, Sunrise's expertise seems to be the missing jigsaw puzzle to “complete” UEM Land as a more competitive player armed with a full set of skills in township and point block high-rise developments. In particular, Wan Abdullah and his team are eager to tap the vast opportunities with the opening up of land for development by the Federal Government and state authorities. Armed with its newly acquired skills, he says UEM Land is more confident to pursue these projects either through the direct acquisition of land or through joint ventures. Besides the Klang Valley, it is also looking out for opportunities in Penang and Kota Kinabalu, Sabah. Regionally, UEM Land has set its sights on India, Vietnam and Cambodia. Contrary to what has been predicted by some naysayers that there will be mass resignation of staff following the takeover of Sunrise, Wan Abdullah says there was no such occurrence. “The key people at UEM Land and Sunrise are still with us today. “There will be a lot of scope and opportunities for all our staff. In fact, the Sunrise team members are excited that they now have the opportunity to get involve in integrated township development. They used to have landbank of around 150 acres which are market-ready, but now they are part of a company with combined landbank of more than 9000 acres,” he says. UEM Land still has 9000 acres undeveloped land in Nusajaya, Johor, and according to Wan Abdullah Nusajaya will be going into “tipping point” towards the end of this year. “When that happens, the demand structure for our property products in Nusajaya will evolve like never before. “This will coincide with the completion of the coastal highway in the first quarter this year; BioXcell and Marlborough College in the third quarter; Legoland, Indoor Theme Park and Traders Hotel in the fourth quarter,” he explains.